A clean and organized house... I think that's all something we'd love to have, but either don't know how to do it or just don't have the motivation to keep it that way. For me, I love being organized. I love going to The Container Store and finding pretty ways to corral all my stuff. While I love having a clean house, I don't find joy in cleaning like some people do. Sure, I do it, but it's something I'll gladly skip if a better option presents itself. Better yet, if someone offers to clean for me! Because of my desire to have a beautiful, clean, and organized space, I've come up with a few techniques to keep my house this way. While I have many room specific tips, I find that in general, it's easier to stay organized when everything has a home and I enlist everyone's help (even my 3 year old son). If you don't implement these two strategies, you'll be fighting a constant battle. ^^^ I'm about being realistic, not Pinterest perfect. We have magnets on the fridge/dishwasher, a few things on the counter, and we keep reusable bags in those large baskets under the island. This is the one I struggle with the most, but also the one I think makes the biggest impact! My rule of thumb is to only keep things out that you use on a daily basis. For our family, that's the toaster, Vitamix, drying racks (for Noah's cups and pots and pans), our knives, cooking utensils (in a pretty jar), dish soap and hand soap, and a fruit bowl. Sometimes I wish I could clear the counters off even more, but this is real life, so I go with it. Have a system in place so that things are put away rather than building up on the counters. All that random junk we bring in from our cars and the daily mail, figure out a way to keep it off the counters. I personally like to go through mail immediately, throw out the junk, and then leave a pile for my husband to deal with when he gets home. That pile goes down to his office each night to either be dealt with or filed away. As for the random stuff that comes in from the car... Noah's school stuff either gets thrown away, hung on the wall, or filed in his school binder. 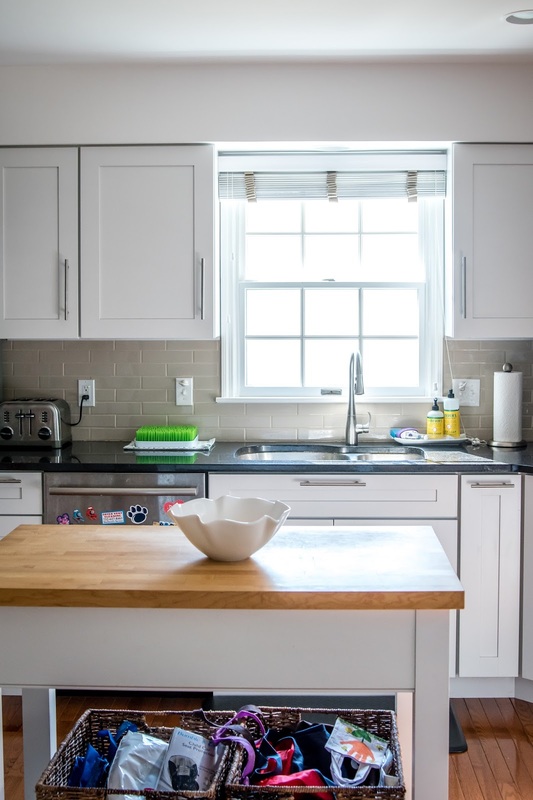 Bottom line, if the counters are clear, it's easier to wipe them down at least once a day. Once you feel confident that your kids are safe in the kitchen, let them help. In addition to helping me bake, I like to give Noah the independence to go grab a snack on his own. I do this by having a step stool in the kitchen and by keeping mommy approved snacks on the lower shelves. This way, I don't have to run to the kitchen every time he wants an applesauce pouch or string cheese. And as he gets older I plan to teach him to help in even more ways... putting his plates in the dishwasher, emptying the dishwasher, and even wiping up his own messes. My veggie chopper is amazing and saves so much time with cutting vegetables for meals. I am in love with my Vitamix. Perfect for our anytime smoothies and I want to try making sorbet in it this summer! And if your garbage disposal starts to smell like mine does, try lemons. I keep a bowl full of lemons on my counter. Each day, I cut half a lemon into small pieces, and run it through the disposal with warm water running. It definitely keeps the nasty smells at bay. Keep two sets of cleaning products... upstairs and downstairs. Bathrooms are my least favorite thing to clean, so anyway I can make it easier (and faster) is a plus in my book! Every week, I spray foam cleaner on my shower, squirt some toilet cleaner in the bowl, and then get to work on the sink and mirrors. Then I can wipe down the toilets and then hop in the shower to finish cleaning in there. Keep up in between cleanings. In between big cleanings, I have some wipes underneath the sink that I use to wipe down the counters and sinks... makeup and toothpaste can quickly make a recently cleaned bathroom look disgusting! We also wipe down our glass shower door/wall with a squeegee after every shower. It makes a huge difference! Clorox Bleach Foamer Bathroom Spray for the shower. This stuff is amazing at getting the mold and mildew out of your shower! A lot of my friends complain about how disgusting their men are in the bathroom. The biggest cause for complaint is the mess they leave after shaving. Thankfully, my husband came into our marriage with a great shaving technique... I can't take any credit for this! He uses a small tupperware like container. He stores his shaving tools in there under the sink, and then when he goes to shave he places it in the sink. He fills it with water and uses it to rinse off his razor. All the stubbly hairs fall into the container instead of getting all over the sink. When he's done, he flushes it down the toilet. It keeps the sink clean and prevents clogging! 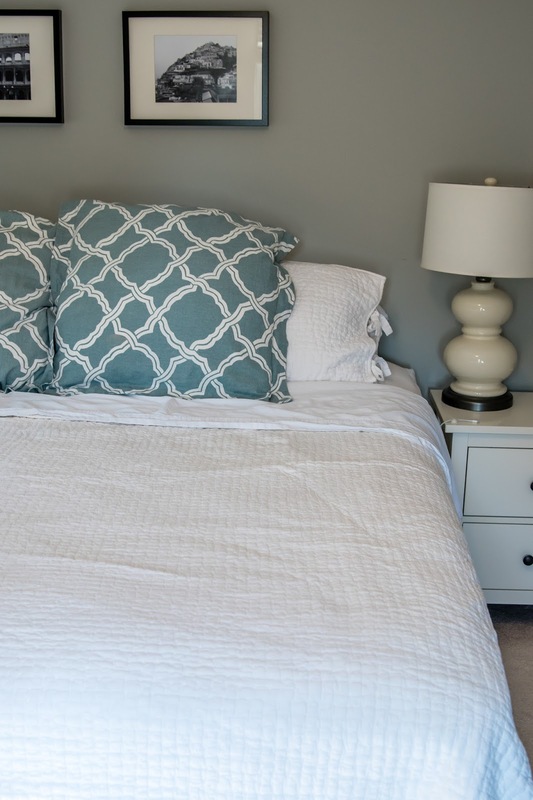 The rest of the room can be a mess, but a made bed will make it look a little better! Even if it means throwing the covers over a mess of sheets, it will help. Once the bed is made, laundry is the easiest way for your room to look messy. Everyone will be different with how often they need to do laundry... but the point is to stay on top of it. Some people like throwing a load of laundry on each day while others like to spend one day doing load after load. I personally like a laundry schedule where I do certain items on certain days and then do a random load of clothing whenever the hamper is full. For instance, I do sheets on Tuesday, towels on Thursday, and clothing usually is twice a week. But you can't just do the laundry, you also have to fold it. I know this is usually the least favorite part of the process, but if you can, I find it best to fold and put it all away the same day you wash it. Otherwise, the laundry process never seems to end. Hang dress shirts up as soon as the dryer finishes. Chris has a pretty casual office, so he wears jeans and a nice button down shirt to work each day. If he had to wear a suit and tie, we'd be having all his clothes dry cleaned. But since he doesn't, I wash and iron (my least favorite part) all his clothes at home. To make ironing easier (and faster), I immediately take his shirts out of the dryer and hang up. While it doesn't eliminate wrinkles completely, it helps A LOT! On our main level, we have one living room. While we do have a play room in our finished basement, Noah has a lot of toys in our living room as well. While I'm okay with that, I still like to be able to clean up and have the toys put away at the end of the day (or if company is coming over). I find that the easiest way to do this is having lots of baskets and bins to store like items together. This is also where having your children help comes into play. It is much easier for a child to help clean up if they know where it should go and it involves just throwing the toys into a basket. Set aside time to clean up! Decide how often you want to clean up a room. My general rule of thumb is to clean up at the end of each day. That is unless it's become impossible to walk through the room or we are having company over. Regardless, it's best to schedule in some time to clean up and get your kids involved. Ten minutes before bed, we make it a competition to see who can clean up faster. I usually give Noah a task, like clean up the kitchen toys or Legos, and tell him it's a race. It's amazing how some simple competition can really get them going! We are fortunate to have quite a few closets in our house. This has allowed me to have plenty of storage for a pantry, linens, seasonal decor, and even gifts. I turned one of our basement closets into a place to store all of my gift wrap as well as random gifts I buy throughout the year. While I use the shelves to house all my random gifts, I use the door to hold all my wrapping paper. No point wasting the door space! This door storage system is amazing and can be used for so many purposes. 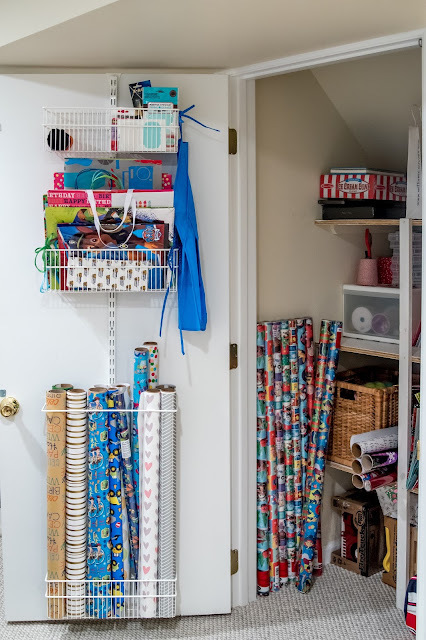 I use it on my gift closet to store all my wrapping paper and gift bags. We also have one on our kitchen closet door to store extra apple juices, light bulbs, and saran wrap. Hang your table cloths on hangers. I used to fold all my tablecloths and keep in my dining room buffet. But then I had to do so much ironing whenever I wanted to use them. So now, I make just a few folds and drape them over a hanger. It's helped a lot! 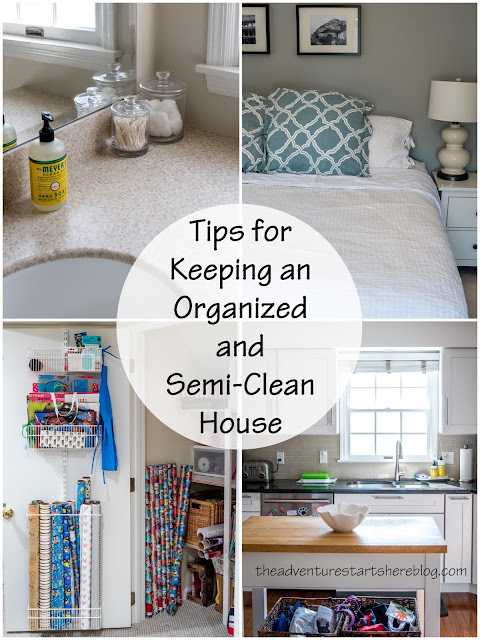 So there you have it, a few tips that help me keep our house organized and somewhat clean. While I love order, I also want my house to look like it has a young family living in it. I want Noah to feel comfortable to play with his toys and make messes. But that he knows that at the end of the day we clean up after ourselves. I hope that my house always maintains this balance. I'd love to hear some of your tried and true tips. 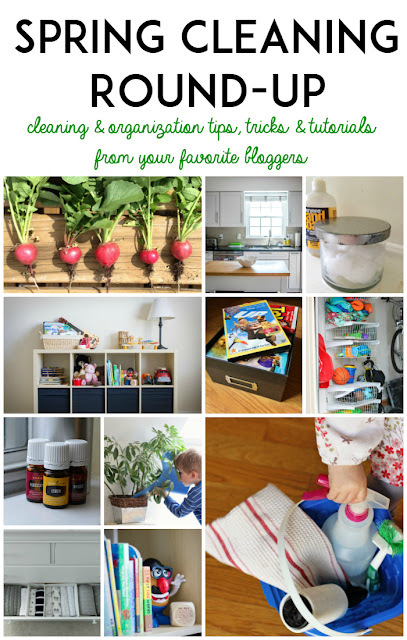 And make sure to check out my fellow blogging friends for their Spring Cleaning and Organization posts... I can't wait to read them myself! In addition to these amazing cleaning and organization tips, we are also doing a giveaway! Use the Rafflecopter below to enter to win one of four Mrs. Meyer's variety gift buckets (a $37 value). Good luck! The giveaway is open to US Residents and runs from Tuesday, March 29th - Monday, April 4th. Counter clutter is one of my biggest downfalls, too! I go in spurts of doing really good & then that is just the catch-all! i'm getting that wrapping paper storage right this minute. All great tips! Wish I could make myself follow them everyday! 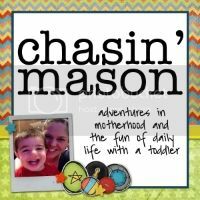 So many great ideas here and I love how you broke it down by room! I agree to having two sets of cleaning supplies - one for each floor. That is huge for me, too! I love the wrapping paper storage idea and I totally need to check out that shower cleaner. Ours gets so disgusting! You are an organizing goddess! Great tips! 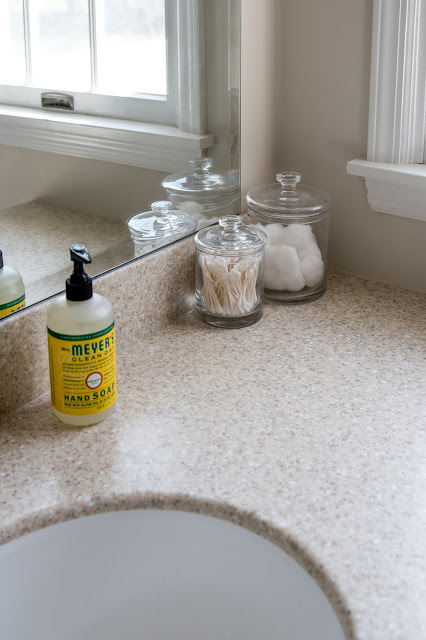 Our countertops are always a mess! I really need to be better about clearing them off immediately instead of letting stuff pile up. And love the shaving tip! My husband shaves in the shower, so we don't have the mess either! 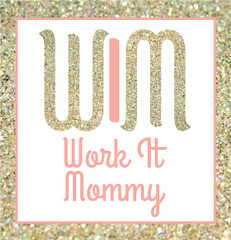 Love this post and your tips! I'll never have a super clean home but I can definitely do semi-clean! I love that wrapping paper organization! These are great tips! I live for baskets and bins! They are my saving grace. Keeping my kitchen counter me clear is seriously the hardest thing for me!!! The rest I can handle. But I also have a cleaning lady so that makes maintenance easy. Counter space is essential but I am loving that shaving tip for men. Drives me batty when my husband does it! 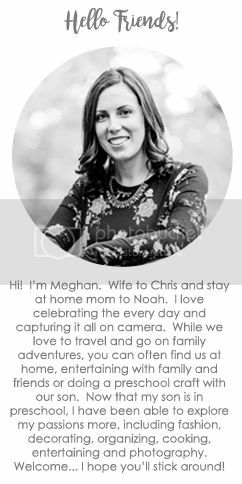 Meghan, you are my hero!! I am awful about the counters even though I keep telling myself I won't be. Ugh! I am going to fix that ASAP. I love what you do in your bathrooms. Keeps everything from building up. And I'm going to make a gift wrap station. Motivation! Every night before bed I straighten the house back up. I put things were they go and wipe off the counters. I love having everything in it's place before turning in because waking up to a mess doesn't do well for my psyche. i like to leave the important mail for my husband to deal with too ;) And yes to making the bed every day...it makes feel all yucky if I don't! So many great tips!!! Great tips! I just recently put a set of cleaning products in the bathroom and it was a game changer! Love your tips, lady!!!!!! Especially the shaving one! Such great tips that door storage system is genius. I really need to revamp a few spaces in our house and will definitely check that out. I am totally with you on the making of the bed too. I'm totally telling my husband about the Tupperware trick!! Genius, thank you! I struggle with keeping my counters clear, too. We just do not have much cabinet storage in our kitchen and I resort to storing things on the counters. I hate the cluttered look of it. I love your white kitchen. That’s definitely a great shaving technique. How lucky are you!! These are all great tips and I need to put them into practice!! You are the most organized and clean person I know. Can you please come over and teach me your ways? I cannot keep up!